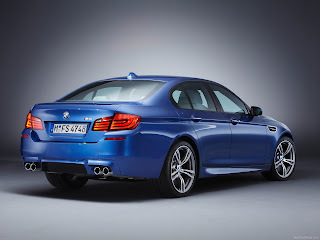 The F10 M5 was released to the public at the 2011 Frankfurt Motor Show, and went on sale in November 2011. Compared to the previous M5, BMW's aim was to create a more sophisticated vehicle." 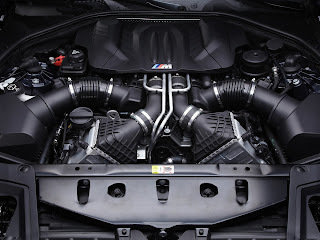 Nonetheless, the F10 M5 is significantly heavier, has synthetic engine noise played through its audio system and has a lower top speed compared to the naturally aspirated E60 M5 V10 it replaces. It is important to note that it did not hold the title of world's fastest production sedan upon release as was common with earlier iterations of the M5. The new M5 uses a variation of the S63 V8 engine called the S63B44Tü, which produces 560 hp (418 kW) and 681 Nm (502 lbft) of torque. The decision to turbocharge the M5 has not met with approval from all fans. One other advantage of turbocharging is that it generates more low-rev torque. A dual clutch transmission is used, with the option of a 6-speed manual gearbox for the US market only. The car features standard blue-painted brake calipers and 19 inch multi spoke wheels; 20 inch split 5 spoke wheels will also be available at launch. In an effort to lower the curb weight of the new M5, which is heavier than the E60 it replaced, BMW partnered with SGL group, a carbon fiber manufacturer. Despite this, the F10 still weighs significantly more than the E60 model and has faced criticism from some quarters for this, its relative lack of engine note and lack of steering feel compared to its immediate predecessor. 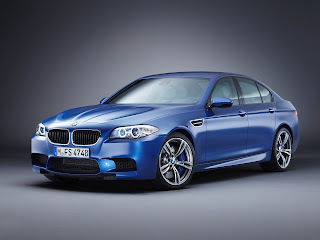 On 15 June 2011, BMW released official press information about the F10 M5. Acceleration from 0 to 60 mph takes 4.4 seconds (0 to 100 kilometres per hour (62.1 mph) in 4.4 seconds) and top speed is limited to 250 km/h (155 mph), which can be increased to 305 km/h (190 mph) with the optional M-Drivers-Package, which remains 15 mph short of its de-limited V10 predecessor. The car weighs 1945 kg, which is 90 kilograms more than the previous E60/61 model. Average fuel consumption is claimed to be 9.9 litres, which is 31% less compared to 15.0 litres from the V10 powered M5 E60. 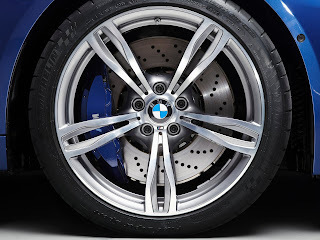 Other details mentioned in the report include an Active M-Differential with torque vectoring between the rear wheels and optional 20-inch light alloy wheels fitted with 265/35/20 front and 295/30/20 rear Michelin Pilot Super Sport tires. The F10's debut was at the Frankfurt Motor Show in September and later in North America at the LA Autoshow on 18 November. The new 2012 BMW M5 also made an appearance before September at the M Festival at the Nürburgring 24 Hours endurance race in Germany on 23 June, the Goodwood Festival of Speed, and has been shown to select members of the M Driving Experience at the Salzburg Ring in Austria. The car has a reported lap time of 7:55 around the Nürburgring race track. 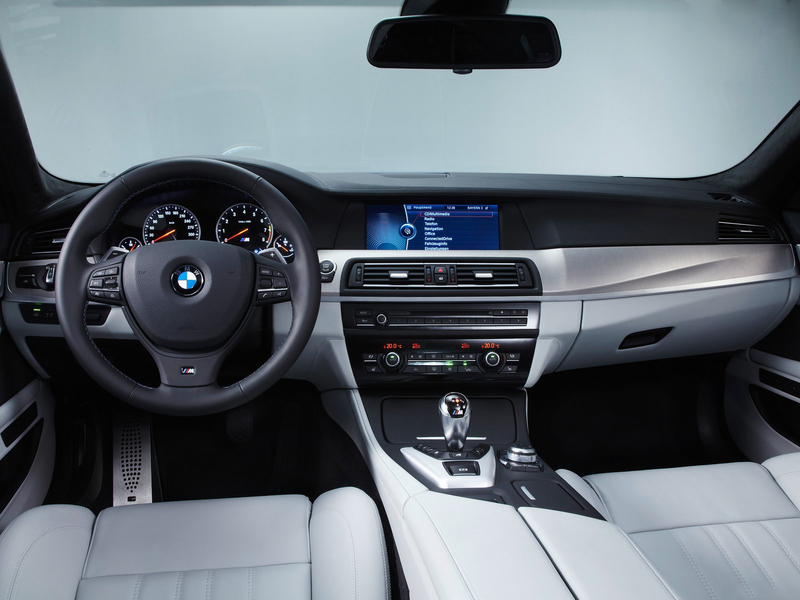 The car's gearbox and fuel economy cited specifically for their improvements over the previous M5, however its inferior engine note and steering compared to the E60 M5 V10 and additional weight have also been noted.